Let Reliable Technologies bring comfort, coziness, and convenience to your house with the review for all kinds of home products you may need. Don’t miss out! Want to buy a cleaning robot for your house? These days, more and more robot vacuums appear on the market making the home technology competition becomes fiercer. Now you are expecting an automatic vacuum cleaner having an extraordinary new feature? 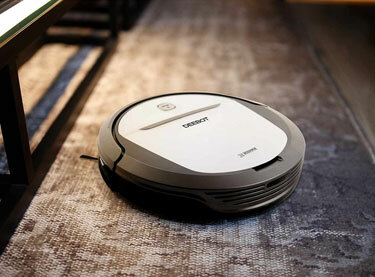 Based on my knowledge, the latest technologies are: 1/ Visual laser mapping and 2/ Wifi connectivity – both are included in Roomba 980. Yet, don’t quickly make the decision! Aside from a set of features, you must also consider the price. Most manufacturers are trying to win over new customers by offering robot vacuums with an impressive number of awesome features while keeping the price as low as possible. ECOVACS DEEBOT M80 Pro is the best option in this case. What are the Reasons to Purchase? 1. How to reset ECOVACS DEEBOT M80 Pro? 2. How to change wifi password on ECOVACS DEEBOT M80 Pro? 3. How to clean ECOVACS DEEBOT M80 Pro? This robotic vacuum cleaner comes with several cleaning modes. Please set the auto mode for a regular cleaning process; meanwhile, you can change to the edge mode so that the little robot will focus on cleaning your wall edges. Additionally, you can try the spot cleaning mode (dirtier spots) and intensive mode (floors). Just like ECOVACS DEEBOT N79, the DEEBOT M80 Pro also lets you choose between vacuum and mop whenever you want. Not just sweeping dust, dirt, and debris, this cleaning robot of ECOVACS also offers the optional mop in order to give your floors a deeper clean. You will absolutely see no spots on the floor. ECOVACS DEEBOT M80 Pro has a 500ml capacity anti-spill dustbin. Pretty large, this unique dustbin is designed to support long cleaning sessions; this means you don’t have to empty the dustbin frequently. Like other robotic vacuums, you can use voice commands to control your DEEBOT M80 Pro. No need to bring your phone out of your pocket if you are already at home; simply tell Alexa you want the robot to start cleaning. Install the ECOVACS app so that you can select cleaning modes, schedule cleaning sessions, monitor accessory status as well as receive alerts. The automatic vacuum cleaner uses advanced auto-clean navigation system with 3 specialized cleaning modes and anti-collision/drop sensors. This helps avoid obstacles and remain its safety from steep drops. From what I know, you can set a cleaning schedule for the M80 Pro just by double pressing the auto button. In case the robot starts a scheduling itself, then you should reset it. Press the auto button to turn on the unit. Insert a needle or paper clip into the hole to press the reset button. Keep holding down the reset button until hearing the ‘beep’ sound 3 times. Note: Please make sure you see the blue light on display. You cannot change the wifi password on this vacuum cleaner. However, if you are having a few issues with connecting the ECOVACS app to the brand new DEEBOT M80 Pro, then I can give you assistance. Set your wifi router to the 2.4G channel. Place the DEEBOT unit as close to the router as possible. Check the connection of your smartphone to your 2.4G wifi to see if it is connected or not. Boot the robot by holding down the reset button till the robot beeps. Check whether or not the wifi light on the DEEBOT is blinking and turns blue. Now install the app and type in the Wifi password to connect to your robot. Wait for the app screen to say "Successfully connected to the router and waiting for the server." The ECOVACS app is not connected to your robot. The instruction here works for both the Android and iPhone app. To keep this cleaning vacuum working for a long term, the maintenance is necessary. Let’s start with the dustbin – having a pretty good design, the dust bin on the DEEBOT is placed under a lid on the top. Thus, in order to get the dustbin out, all you need is to lift the lid and pull the handle. Now move to the air filter – very durable, it will last a long time if you know how to maintenance the right way. In front of the air filter has a screen which is on the inside of the dustbin; this helps catch most stuff leaving the actual HEPA filter fairly clean. A set of DEEBOT M80 Pro also offers an extra air filter. When it comes to ECOVACS DEEBOT vs. Roomba, the M80 Pro’s bristle roller is not as nice and durable as the Roomba’s rubber roller. Right after using the DEEBOT unit, you have to constantly clean the bristle roller. The task is more difficult once hair gets wrapped and tangled around the bristles. On the other hand, it’s much easier to clean the Roomba’s rubber rollers. Read the ECOVACS DEEBOT M80 Pro robot vacuum cleaner manual included inside the product package. Overall, if you cannot afford a Roomba yet still want to find a high-quality robotic vacuum cleaner, then ECOVACS DEEBOT M80 Pro is a decent option. Offered at a budget price, this unit is worth purchasing if you are tight on money. Most Roomba products tend to cost you loads of money. The DEEBOT M80 Pro has one year warranty. If you have any question about this cleaning robot, leave them all in the following comments. 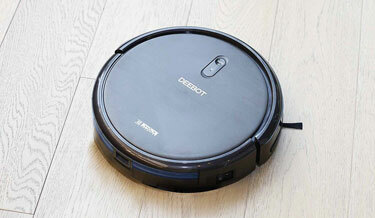 If you are looking for a robotic vacuum cleaner that fits your tight budget perfectly, then consider ECOVACS DEEBOT N79. This product is one of the least expensive that you can buy without any worry. Featuring the built-in Wifi, you can control your robot from anywhere using the ECOVACS app or included remote control. However, it lacks the operation via voice control through Amazon Alexa or Google Home. However, you shouldn’t get it if you have deep-pile/shag carpet or live in large open areas. You can download full DEEBOT N79 manual here for complete instructions! ECOVACS never disappoints their consumers. Known as the floor cleaning robot, ECOVACS DEEBOT is designed to have the self-cleaning system. It’s also packed with Smart Navi Technology and Smartphone application to give the perfection to your house. With the release of the N79 model, they still continue their commitment to smart home technology. In addition, the integration of Google Home and Amazon Echo makes DEEBOT N79 the most outstanding in the DEEBOT series. Just install the ECOVACS app to your phone or any smart home device so that you can control the robot fluidly with ease. Now, no matter where you are, you still enable to navigate when and how it clean. Overall, DEEBOT is undoubtedly the best vacuum cleaning robot on the market. How do I reset my DEEBOT? The reset process is quite simpler than you may think. In order to reset your DEEBOT, all you need is to press and hold the START/PAUSE button for 3 seconds. Then set the current time. Once the scheduling has set successfully, make sure you hear the *beep* sound 3 times from the device and the indicator light will turn blow after that. If the scheduling is cancelled, the device will still beep 3 times but the indicator light will go green. Of course you can fix this issue by removing and replacing the DEEBOT’s motherboard. How do I connect to DEEBOT wifi? Just got a new DEEBOT for your home? Don’t know what to do as your DEEBOT N79 wifi won’t connect? A very common problem that most DEEBOT consumers often encounter is – they find it frustrated to connect to the built-in wifi. Let me remind you that your house is running on a 5GHz network. Oftentimes you have a 2.4GHz band and a 5GHz band to choose from. Therefore, it’s significant to connect to the 2.4GHz bandwidth router if you want to link your robotic cleaner to the wifi. Create the connection between the app and the robot is actually quite easy. Initially, ensure your home wifi is set down to the 2.4GHz band. All ECOVACS products primarily work on 2.4GHz bands and most routers are also dual-banded, so it’s not a big matter as the system will automatically switch this; nevertheless, there are some routers require you to do the setup manually. Follow the steps of how to do this either from the ECOVACS DEEBOT N79 manual or find it online. Immediately turn on your robot once you take it out of the box. Start the app on your smartphone and approach your DEEBOT robot as close as possible. Press and hold the AUTO button for 3 seconds until you hear a sound from it. Once you do that, let’s see if the wifi light illuminates on the device or not. If yes, then just access to the app. Read the instructions on the app to find out the steps of how to connect to your DEEBOT. The connection time takes less than one minute. Please keep in mind that you have to stay close to the robot as this helps fasten the connection. When purchasing DEEBOT N79, you also receive the manual in which has a handy maintenance guide. After each time cleaning your device, you’re advised to empty the dustbin and then wash it under running water. Additionally, you should take out the sponge and all high-efficiency filters in order to remove stuck debris. Rinse only the sponge filter, not the high-efficiency filter. For the side brushes, you need to clean them once every two weeks and replace them every 3 to 6 months according to the manual. But, the maintenance depends mainly on how often you use the vacuum as well as on usage. Don’t forget to change the filters every 4 to 6 months. Also, once a week, the device’s sensors need to be clean with a soft dry cloth. This ECOVACS DEEBOT robot vacuum can be used without wifi. Therefore, you can choose to skip the setup step with wifi connection. This means you are unable to utilize the app, obviously. Refer to the manual or call customer support whenever you get stuck with ECOVACS DEEBOT N79. Copyright © 2019. Reliable Technologies All rights reserved.